What could be better for a nice start of a day than a cup of coffee? And is there better coffee than the rich, flavored and dense roasted Columbian? And what if there is a typeface that will create exactly the same feelings like this famous coffee? Now Carlos Fabián Camargo Guerrero – the founder of Andinistas type foundry offers CoffeeBreak – a font family that will do exactly that. It will immediately evoke feelings of happiness, friendliness and joy in those that lay eyes on it and will definitely make their day. 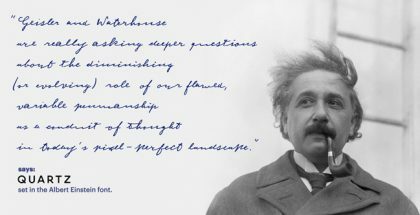 CoffeeBreak is a modern brush script font family that is a very good proof of the masterful calligraphic penmanship Carlos Fabián Camargo is capable of. With it he gives the users a powerful tool with which they can explore plenty of possibilities and achieve magnificent results. 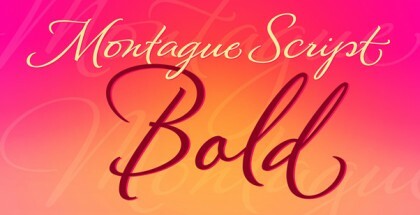 He offers a few remarkable fonts within the family. Firstly, there are CoffeeBreak A & CoffeeBreak B – two fonts in which swashes and ligatures are abundant and very skillfully drawn. 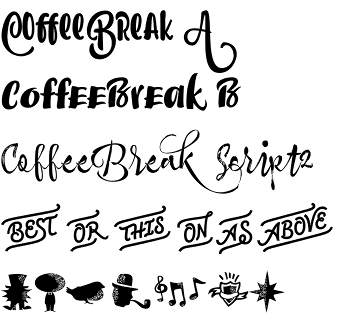 Then comes CoffeeBreak Script1 & CoffeeBreak Script2 – two decorative fonts that resemble handwriting and, as such, have pronounced individual appearance. CoffeeBreak Words & CoffeeBreak Words Bold includes words that are designed with the purpose to draw people’s attention. And finally, there is CoffeeBreak Dingbats – very nice and playful set of figurative silhouettes that will add informality and warmth to any project. Overall, CoffeeBreak font family is suitable for a wide range of applications and especially when a certain level of artistic “flavor” is required. Get CoffeeBreak font family and explore your artistic side!